You can do speed training and strength training with this Training Resistance Parachute both at the same time. It will also give you the guts you're looking for so you can improve or master you skills. The belt is adjustable and fits almost all sizes. 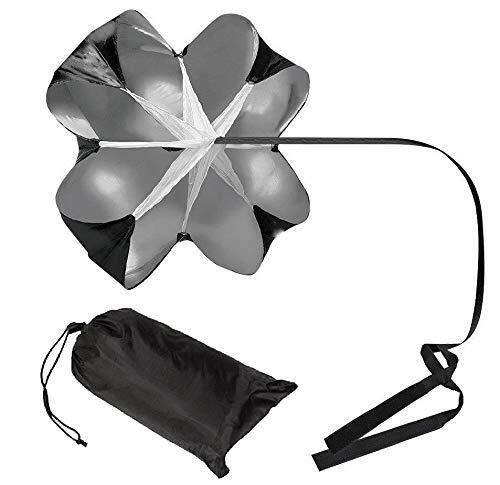 This parachute stores easily in an included training bag. Thus, you can spend more time training and less time setting up. It has a built-in mesh panel which helps balance the Running Parachute during training and prevent the cords from tangling, rendering a less hassle sports activity. Customer Satisfaction is our main goal. If you have any questions on concerns Contact Us any time. DURABILITY. It has a built-in mesh panel which helps balance the Running Parachute during training and prevent the cords from tangling, rendering a less hassle sports activity. Approximately, it offers 15-35 lbs of resistance.